A great injustice has finally been righted. That was my initial thought when I learned that former New York Knicks star Bernard King had been elected to the Basketball Hall of Fame. Those who were fortunate enough to see the 200-cm small forward play in the NBA at the height of his powers will tell you that he was an incredible offensive force that was nearly unstoppable. He was gifted and absolutely electric. While other players, who were great in their own right, but nowhere near the player that King was, gained admittance years earlier, the Brooklyn playground legend was made to wait until the age of 56 to get the nod. Other fans were stunned to learn that King wasn’t already a member of the hallowed Hall. I was well aware that Bernard was not in and considered it nothing short of a travesty. The reasons behind it lie in the clandestine way the Hall annually elects new members for the pro and collegiate ranks, in the view of some, and in King’s previous run-ins with the law, in the eyes of others. Remember, this is the Basketball Hall of Fame we are talking about, not the Good Citizens Hall of Fame. The Hall of Fame, located in Springfield, Massachusetts, has a bizarre system that sees anonymous judges select the pro and college nominees each year and then refer them to an honors committee, which is comprised of 24 more anonymous judges. To make matters worse, the Hall does not reveal the results of the elections, though it is known that one must receive the vote of 18 of the 24 judges to gain admission. The cloak and dagger method has been called into question over the years as more deserving individuals — like King — have been continually passed over, while lesser talents were admitted. I have nothing against Alex English or Adrian Dantley, but for those guys to get in before Bernard was wrong. This entire issue brought back memories of my own days in the NBA, and one instance in particular. When I was the director of public relations for the Los Angeles Clippers in the late 1980s, our team was selected to play in the annual preseason Hall of Fame game in Springfield against the powerhouse Detroit Pistons. This really surprised me, so I asked him why. I was a bit taken aback by this, but after looking at the Hall roster at the time and considering what he had said, I concluded he was right. We went back and beat the Pistons in that game, and true to his word, Elgin did not accompany the team. It doesn’t seem likely that race had anything to do with King’s election taking so long, but rather the fact that early in his NBA career he was arrested a few times and then was charged with domestic violence against his wife in 2004 (the charge was later dropped). But with the way the Hall conducts business, who really knows why it took 20 years after he played his last game for King to get in? This issue aside, King’s greatness was undeniable. All of this would be moot if he had not suffered a devastating knee injury during the 1985-86 season with the Knicks that forced him to miss almost two full seasons while rehabilitating. At the time of the injury, King was the top scorer in the NBA (averaging a career-high 32.9 points per game) and ended up winning the scoring title that season despite playing only 55 games. It was absolutely tragic that he was cut down in his prime, but he pledged to return and made the All-Star Game six years later with the Washington Bullets. The final record shows that King was an All-Star four times, named to the All-NBA first team twice, voted the league’s Comeback Player of the Year in 1981, and scored 50 points in a game eight times. He averaged 22.5 points in 874 career games. When he scored 50 in games on consecutive nights in 1984, he was the first to do it since Wilt Chamberlain 20 years earlier. This season, fans who watch the NBA online have been treated to director Spike Lee’s short piece on Bernard’s career-high 60-point game against the Nets in 1984. As I have seen it played repeatedly, I have wondered if it might be the push needed to get him into the Hall. My connection with Bernard was more personal than most because I was blessed to have had the chance to watch him up close when he played two seasons for the Golden State Warriors (1980-81, 1981-82) early in his career. He had been traded to the Warriors by the Utah Jazz after getting into legal trouble in Salt Lake City, and going through a stint in rehab for drug and alcohol issues. I had worked for the Warriors in high school in the Bay Area and was around the team during my college days in Southern California. 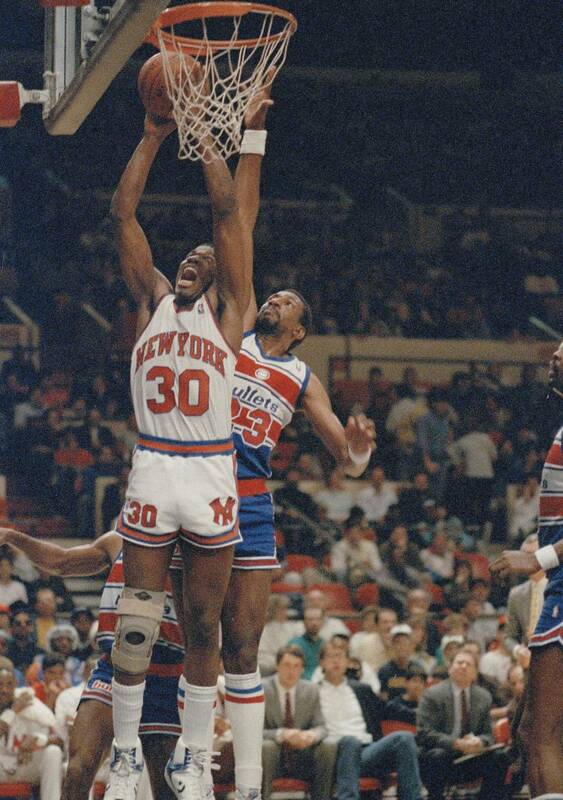 I can still remember looking forward to seeing Bernard fly in from the wings with his two-handed dunks. He was always polite and pleasant with me. When I asked if I could interview him for a school project about the NBA’s early-entry rule (which allowed underclassmen to leave college early for the pros), he patiently spoke to me about the issue. Bernard himself had left the University of Tennessee after his junior season, when he was a first team All-American, and was selected in the first round of the draft by the New Jersey Nets in 1977. I was never sure who got a bigger charge out of seeing Bernard play, me or my college buddies. “Well, he’s like a volcano about to erupt,” I told them. “What do you mean?” my friends would ask. Having the chance to see something like this up close was truly amazing and has stayed with me all these years. My instincts told me then that I was getting a rare chance to see a true master preparing for action. One of my prized possessions from my long career in sports media is a photo of Bernard and me standing together on the floor of the Los Angeles Sports Arena before a game in 1988. It was a moment in time when basketball was my entire life. 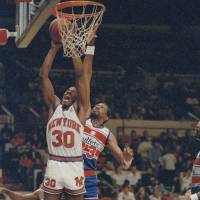 Though things have changed 25 years later, I still think of that photo often and recall fondly what a basketball genius Bernard King was.